Every corner and every area of Montana is beautiful, but each in its own unique way. From the Badlands to the Flathead, from the Hi-Line to Yellowstone, over every rise is a new vista. You may have noticed, a good share of these vistas include tended fields of crops, depending on the season. Have you ever wondered about the kind of men and women who farm this land? What is their lifestyle and what do they do to care for these outsized gardens? The truth is, their lives are similar to that of most small business owners: purchasing supplies, selling their product, bookkeeping, and staying abreast of new trends and opportunities in their industry. They have mortgages and send their children to school and volunteer in their communities. Their difference is only that they work in unison with the soil and weather to create the food destined for your grocery store, your restaurant, and, ultimately, your dinner table. Records show there are 27,000 farmers in Montana, but this number includes any who have a few acres for their horses and any who may have a few acres to till because they were able to buy some acreage and build a house outside the cities. 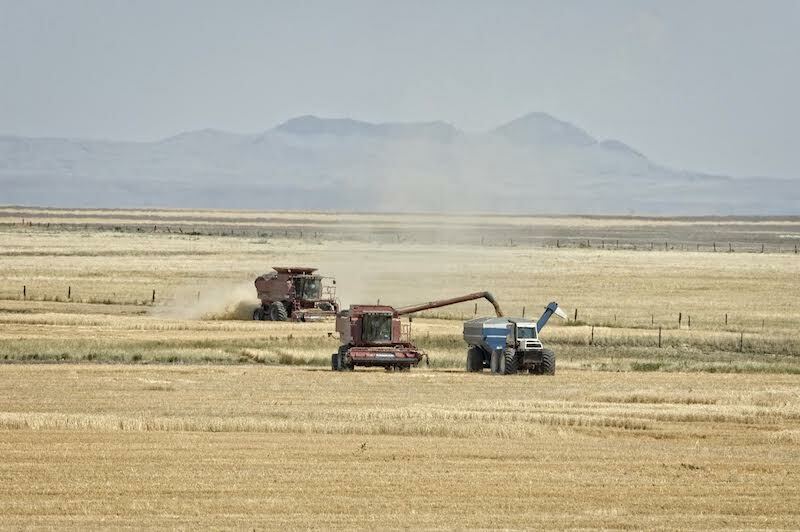 Most of Montana’s grain is produced by fewer than 5,000 full-time farmers who rely on farming for their livelihood. These full-time farmers are typically the descendants of our early pioneers who homesteaded Montana over 100 years ago. A century of lessons from Mother Nature taught us how to flex with Montana’s interesting weather and how to care for the land in a sustainable way. These are the farmers who form Montana Grain Growers Association (MGGA). Farm policy is important to our nation, affecting everything from our financial markets to the price of food. A group of forward-looking farmers founded MGGA in 1958 with a goal of working together to solve issues of marketing, scientific research, government policy, and shared knowledge. Today, nearly 60 years later, MGGA is going strong and remains an organization of volunteers who serve their neighbors and work to foster a good business climate for those who make their living providing food for the world. Exports and trade are crucial to Montana’s farmers, since production far exceeds the needs of our state’s 1 million population. MGGA works with others to promote good foreign trade policies and the promotion of markets. Because of our proximity to the ocean ports of Seattle and Portland, our best export markets are the Pacific Rim countries. Japan, Korea, China, India, Malaysia and a number of other countries hold huge populations that enjoy Montana’s high quality grains. Delegations of grain buyers and flour millers from these countries love to visit Montana farms to see how we grow their food. Not all our products are exported, however, and we support in-state flour mills and barley malting facilities which, in turn, hold a reputation for providing the best quality products for the food industry. This provides jobs and economic activity, adding to the importance of Montana’s number one industry. MGGA is constantly working to guide lawmakers in their efforts to provide good food policies for the nation. The most important of these efforts is the Farm Bill, which is rewritten every five years. Designed to aid the nutrition of those who live in poverty, a small but important part is allocated to mitigate the inherent weather and market risk that farmers face. This is good for America because less volatility in the farm sector means more affordable food for its citizens. Scientific research and education are also passions of MGGA and its members. In the last 3 years, we have donated over $1 million to these efforts. All this from a volunteer organization! So, the next time you travel the roads of Montana, take notice of the fields of grain – that’s where your food comes from!